Before I moved into my house, I lived in a small apartment. One of the reasons I selected this apartment was because they featured washer/dryers in each unit. When I first moved in, I had one of those stackable units (washer on the bottom, dryer on the top) which worked just fine. However, about six months into my lease, the washer stopped agitating and the maintenance crew hauled it away and replaced it with an all-in-one unit. I asked why they were replacing the stackable unit with this one, and I was told the owner got a good deal on them and was able to get some sort of energy rebate. Putting this unit in the laundry closet gave me some extra room, so I had the maintenance crew install some shelving. From what I could see, the machine rolled in easily and connected without any problems. It was ready to use within 15 minutes. I must say that it took a long time to get used to this new-fangled all-in-one unit. First, it took much longer to wash and dry the same amount of clothes. Whereas I could wash and dry a load of clothes in about 90 minutes, it now was taking me about 2.5 to 3 hours. There are a lot of bells and whistles on this machine, including being able to have it tell you how long it will take to do the entire load (it has some sort of sensor that weighs the load) but I didn?t pay much attention to it since every load I put in took about the same amount of time. There is no need to vent this unit, and it seems to be very energy efficient (both good points). The condenser-type dryer leaves clothes a bit damp, so if you can yank the clothes out as soon as the cycle is over, it will help keeping shirts and slacks wrinkle-free. It has a delay start timer, so you can set it to begin washing in the middle of the night, if you wish, and it will be done in the morning. Or set it to start in the middle of the afternoon and it will be finished when you get home from work. However, I don?t like to keep my appliances running if I am not home, so I don?t really use that feature. I finally got used to this unit and the differences it had from the stackable unit, but if it were up to me, I would go with a traditional washer and separate dryer (or a stackable unit) before I?d buy an all-in-one unit. I now live in a house and appreciate having separate units. But if you?re in a small apartment or condo and are cramped for space, this LG washer-dryer combo will work well if you take the time to read the manual and understand how it works. I think I would have appreciated it more if I hadn't had a different unit when I first moved into the apartment. It's always hard to accept changes! Join in and write your own page! It's easy to do. How? 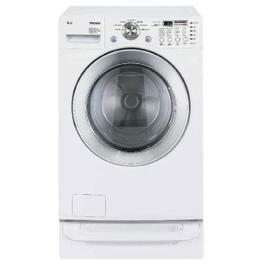 Simply click here to return to LG Washer Dryer Combo.